Teeth come in all shapes, sizes and colors. Your primary goal when retouching teeth should be to keep the teeth from distracting from the eyes. If teeth are very colorful, then they can be distracting, but if you make them bright white, then you’re not doing any favors for your subject when people meet them and see yellower teeth than their portrait depicted. Lightroom’s Adjustment Brush is a good tool for whitening teeth. One of the best things about using it is that the Auto Mask feature allows you to paint sloppily but keep the effect on the teeth automatically. Just make sure that when you paint the plus sign inside the brush stays on the teeth. As you paint across shadows on the teeth, you may need to click the plus sign each time you change tones/colors significantly. Lightroom has a preset for whitening teeth, but it’s too strong. Here are the settings I use for the adjustment brush. Set your sliders to the same positions, then click next to the word Effect and choose to Save Current Settings as New Preset. I named mine, “Real Teeth.” If settings aren’t strong enough, right click on the brush’s button and choose Duplicate, which doubles the effect without repainting. 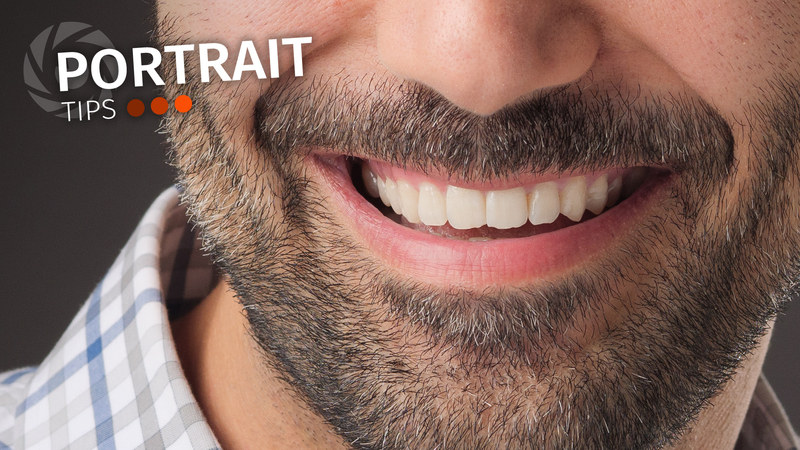 Teeth are a permanent feature of your subject’s face, and altering them too much can present a false impression. Be gentle and talk with your client about how much whitening they want. Lightroom helps you get it done easily, but try these gentler settings instead of Lightroom’s default.